U.S. and Russia reach deal to avoid dogfights over Syria. 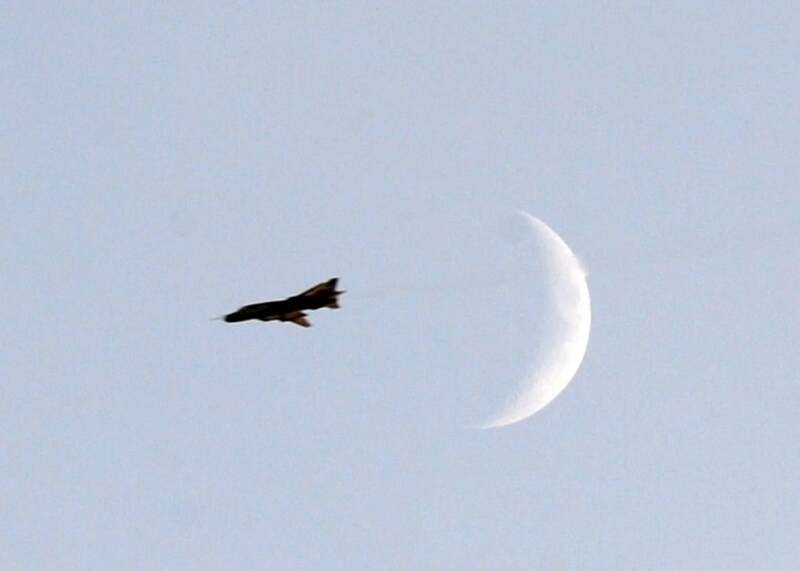 A Syrian army fighter jet flies over the northwestern town of Maaret al-Numan on Oct. 19, 2012. The U.S. and Russia have signed a memorandum of understanding intended to avoid accidents in the increasingly crowded skies over Syria. According to CBS News, “the memo includes specific protocols for air crews to follow over Syria,” and establishes ground communications between the two sides. This does not, U.S. commanders will stress, indicate cooperation between the two countries. Even if coordination is not technically cooperation, the new measures are intended to at the very least avoid direct conflict between the two militaries. There certainly has been abundant risk of such a scenario. U.S. pilots are under orders to maintain a 20 nautical miles distance from Russian aircraft and in one incident in the past two weeks a Russian jet flew within 500 feet of a U.S. fighter. In another, they came within 1,500 feet of each other. In addition, Turkey has accused Russia of violating its airspace in several instances and shot down what it says was a Russian drone last week. NATO also claims that Russian cruise missiles fired from the Caspian crashed within the borders of Russia’s ally Iran in early October, though both Moscow and Tehran have denied this. While the U.S. may not like Russia’s intervention, arguing that it strengthens ISIS by targeting rebel groups fighting against both the Islamic State and the Syrian government, Tuesday’s deal is further indication that America isn’t going to do much about it. Syria is effectively being divided into two conflict zones. In the west, Assad’s regime backed by Russian airpower and Iranian ground forces fights against the rebels and, to a lesser degree, ISIS. In the East, Kurdish forces and a smaller group of Arab rebels attempt to take the fight to ISIS’s de facto capital, Raqqa, under U.S. air cover. This division may be the best way to avoid an accidental U.S.-Russia dogfight, but it certainly doesn’t bode well for pacifying Syria anytime soon.